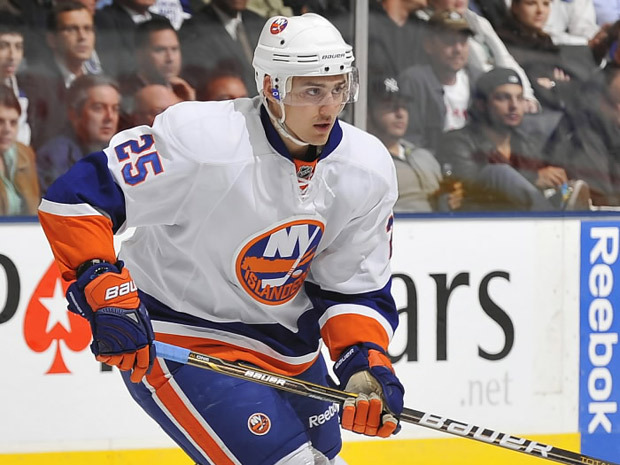 Dirty Dangle Hockey: Why Are The Islanders Playing Around With Niederreiter? Why Are The Islanders Playing Around With Niederreiter? Nino Niederreiter, who was the Islanders 1st round pick at 5th overall in the 2010 NHL Entry Draft has been a healthy scratch the last 4 games and is getting fat eating pressbox popcorn. It seems like he is not ready to play in the NHL just yet, but why are the Islanders having a young, top prospect sit around missing out on game action? Niederreiter made the Islanders out of camp last season as an 18-year-old and played 9 games, registering a goal and an assist, before being sent back to the Portland Winterhawks of the WHL. This year he battled a groin injury during camp and played a few games in the AHL on a conditioning stint before joining the big club. So far he has got into 3 games for the Islanders and hasn't registered a point with a -4 rating. Garth Snow has said he won’t send Niederreiter back to the Portland Winterhawks, so that means he plans to keep him up with the Islanders all year (he is too young for the AHL). There has to be something going on behind the scenes with Niederreiter. I can’t see him being traded, but why have a 19-year-old up with the big club, but not have him seeing any game action is just plain stupid. Even when he was in the line-up he averaged 10:43 TOI. The Islanders are already looking to be out of a playoff spot, so why not have one of your top prospects get some playing time and give him some minutes? He has the size at 6'2" and 205 pounds to play in the NHL, so it’s not like he's physically not ready to play with the big boys. Niederreiter is projected to be a power forward type with tons of scoring upside, so basically the kind of player Brian Burke drools over. The Islanders need to figure out what they are going to do with him because his potential is being wasted right now. Yes, he might be practicing with the team, but practice helps you work on your skills. Players develop playing against other NHL players and being challenged in certain situations. Who knows what being a healthy scratch is doing to his confidence. When you look at the 2010 draft class, the four guys drafted before him are playing in the NHL, and the guys drafted after him, like Brett Connolly, Jeff Skinner, Alex Burmistrov and Cam Fowler are already full time guys making an impact. What do you think about the Islanders and Nino? Should he be sent back to junior, or given a chance to make an impact like others in his draft class have? I know I wouldn't mind seeing him dominate in this years World Juniors. He is not ready and should be playing 20 minutes a night in the WHL. Not sure what Garth Snow has against him playing JR. He will be a NHL player, but shouldn't have been drafted so high. From Elliotte Friedman's 30 thoughts. I don't think Nino becomes that great.